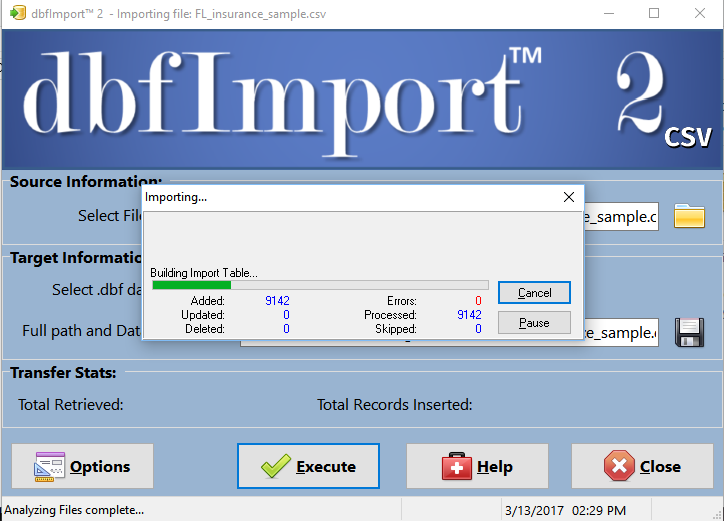 Introducing dbfImport™ 2 the easiest way to import your dBASE data! – dBase, LLC. Browse: Home > Introducing dbfImport™ 2 the easiest way to import your dBASE data! Introducing dbfImport™ 2 the easiest way to import your dBASE data! 2nd Generation Data Manipulation Utility for Working with dBASE Data! BINGHAMTON, N.Y. – March 15, 2017 – PRLog — dBase, LLC (http://www.dbase.com) today announced dbfImport™ 2 the second edition of the utility to make the job of working with dBASE™ data a lot easier and give you more control at the same time. The new dbfImport™ 2 can convert dBASE data from CSV, and Microsoft® Excel® (both .xls and xlsx files) into .dbfs with memos supported as well. What makes dbfImport™ 2 better than the prior version? 1. Select the data from a .csv, .xls, or .xlsx – Without Excel® being loaded! 4. Set any of the advanced settings for the import process. 5. Press the Execute button to begin the import process. Created in 1981, dBASE is still used by millions of software developers and others in Fortune 1000 companies and government agencies worldwide. dBase, LLC was created in 2012 by a group of investors, experienced technology leaders and former employees of dataBased Intelligence, Inc. (dBI), a privately-held company that had been the legal heir to the dBASE database management system. As guardian of the dBASE™ brand, dBase, LLC is committed to revitalizing its flagship product while also delivering a new generation of data solutions to help small- and medium-sized businesses, work teams and individuals transform data into actionable information. The price for dbfImport™2 for $39.95 (USD). dbfImport™ 2 is available today on Windows Vista and above operating systems including the latest Windows 10.